LogiXML has recently launched Widgenie, a web app that lets users upload data from spreadsheets, CSV files, or Google Docs (among other sources), play around with them on a GUI and then output the results thru by embedding on blogs and social media apps. Widgenie empowers everyone, from bloggers to business people, to quickly visualize data and share it in many different ways. Now you can publish data in the places you already know and love, places like iGoogle, Facebook, WordPress, and even your own website. We combine all the power of an enterprise-level business intelligence platform and provide it in a convenient Web 2.0 widget. While most bloggers won’t probably be needing to present any data visually, I think this would be useful for presenting survey results, traffic stats, trends, and the like. 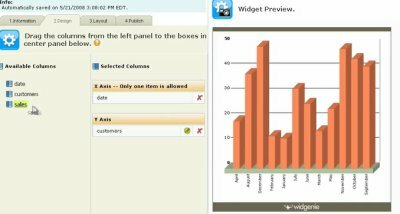 Business or corporate bloggers would perhaps find Widgenie a useful tool in sharing data with colleagues and/or readers in a visually appealing presentation. I like this idea a lot. Statistics and numbers mean very little without the process of visualizing what is really happening. I think this could be great for case studies and other blog posts that often occur in the blog tips world. Facebook, WordPress, and even your own website. We combine all the power of an enterprise-level business intelligence platform and provide it in a convenient Web 2.0 widget.